Southerly 10/15 knots, reaching up to 20 knots south of Port Kembla in the evening. Seas: Below 1 metre, increasing to 1/1.5 metres by early evening. Swell: Easterly around 1 metre. Outlook Friday: Southeast to southwesterly 15/20 knots becoming variable about 10 knots early in the morning. Seas: 1/1.5 metres, decreasing below 1 metre during the morning. Swell: Easterly around 1 metre, increasing to 1/1.5 metres during the morning. Outlook Saturday: Variable below 10 knots becoming northeasterly 10/15 knots in the evening. Seas: Below 1 metre. Swell: Easterly 1.5 metres. Outlook Sunday: North to northeasterly 15/20 knots. 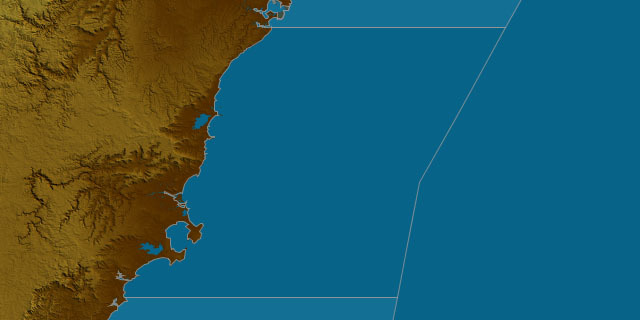 Seas: Around 1 metre, increasing to 1/1.5 metres south of Port Kembla during the evening. Swell: Easterly 1/1.5 metres, decreasing to around 1 metre during the evening.